May is here and it feels like its summer in Bergen. As everyone is heading out to enjoy the weather, we stay inside to continue the work on our projects. Spinsling is getting ever closer to release on IOS and our new projects are starting to take shape, so it is exciting times for us at Retrogene. We are not yet ready to start talking about our new projects, but we are hard at work and can hopefully share something soon. What we can tell, is that the new projects are developed for mobile devices. Lately we have been working on development tools, which we can use for our own projects. These will likely be used on multiple projects and will speed up certain aspects of the development process. Thats it for today! Take a peek again soon for another update and maybe some more information on the new projects. 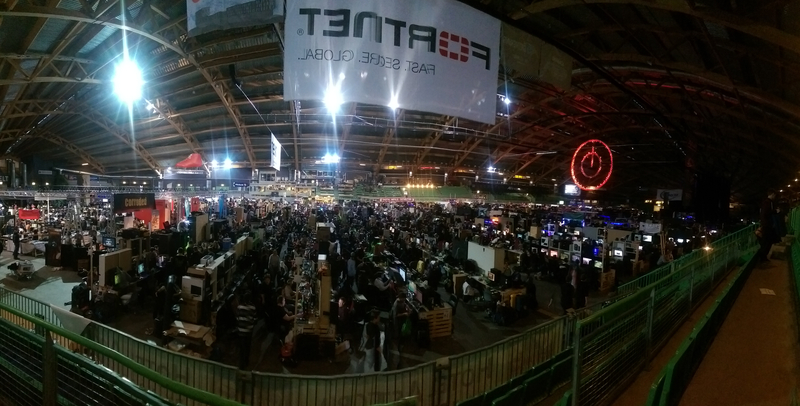 Retrogene was attending The Gathering 2016, the worlds largest LAN-Party, showing off SpinSling! 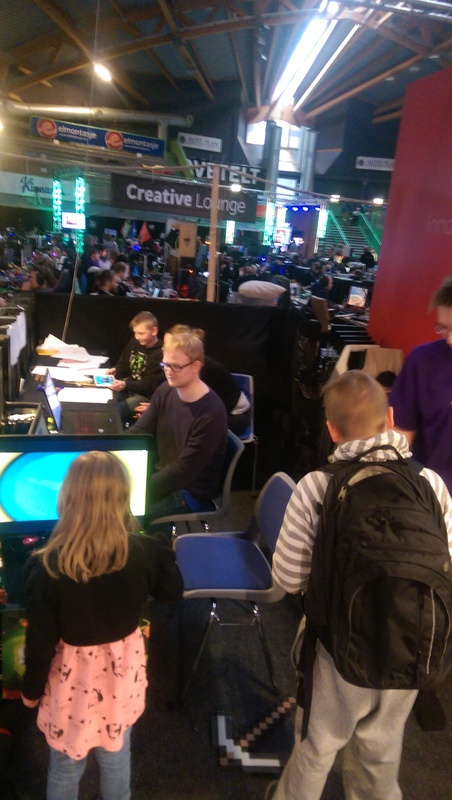 We were offered a stand in the developer area among other indie developers. Here we were showing SpinSling as well as having a drawing competition and a top-score competition. We had people in all ages stop by our stand and try out SpinSling. The feedback we got from people were amazing! They seemed to enjoy the game alot, as well as most people said it was addicting, which we take as a compliment. We also got several drawings handed in for the competition, where we will pick out a couple of drawings that will make it into SpinSling as a costume or a character! During our stay at TG2016, we also participated in “Game Development” competition as well as the “Fast Game Development” competition, where the theme for Fast Game Dev was “Weightlessness” and we were given 48hours to make a playable game based on this theme. As for the “Game Development” competition, we could submit any game that have not previously been released or entered in any other competition. 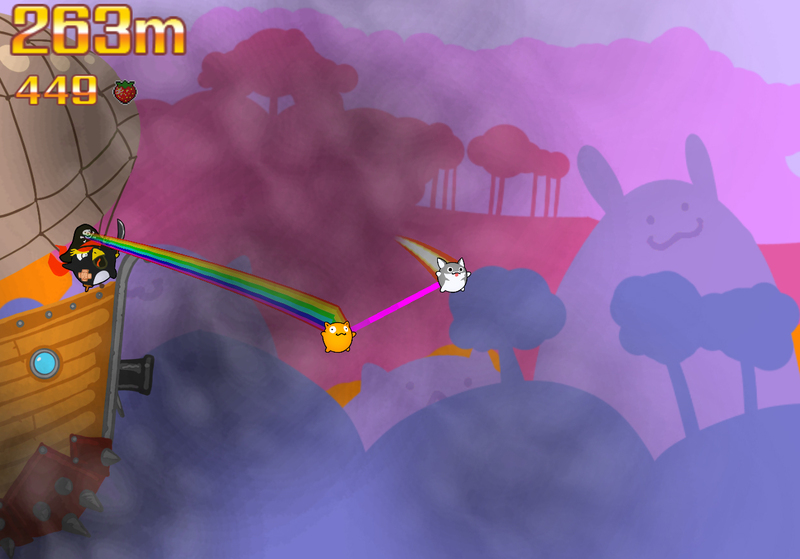 Here we chose to submit our in-house 48hour game-jam game called «Bubble Warriors»(can be downloaded here). This is a 2-player game, about two fishes fighting for the survival of the fishtank. 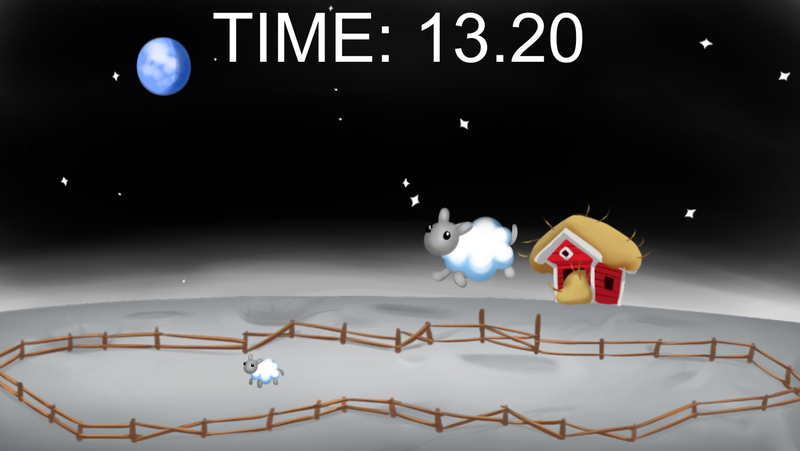 We even got 3rd place in the Game Development competition with «Bubble Warriors»! That’s it for now, but stay tuned for more information about our development and what we are currently doing! Hello! While we were polishing SpinSling our art crew had some spare time and started pre production of a short 3D sketch. The purpose of the 3D sketch is to advertise for holyday costumes in the game. First a small 2d animatic were made so we could figure out how our idea played out. This idea is about our main characters and antagonist from SpinSling wearing costumes as Knights and King. The king arranges a duel between our knights where the winner wins a strawberry. The duel Ends with a shocking plot twist. The first version of the 2D-Animatic were good, but we wanted to take another step further and make the punch line better , we ended up with two more edited versions to choose from. Ater some discussion we picked out the third version to go for our 3D-Sketch. Lately we have shifted our focus on different projects that require our attention. We will definitely return to the 3D sketch in the future and continue! Welcome to our new offices! It’s been a little while since our last post, but we have decided it is time to start blogging again. In the last few months we have been polishing our forthcoming game: SpinSling. We have been using feedback from players to make it as good as possible before the world release, and we can share that its right around the corner. We are excited about releasing our first game, and can’t wait to make it available to everyone on both iOs and Android. As we are getting closer to the release of SpinSling, we have started working on some new projects behind the scenes. This time we have decided to focus on smaller projects with a big emphasis on gameplay mechanics and lasting appeal. These projects are still unannounced, and will be revealed later this year. We think it’s going to be something for everyone, as these two games are quite different from each other. We will continue our path on making fun and engaging games for mobile devices, so stay tuned for further updates. While waiting for our games in production to finish, you can check out the games we made in our previous in-house GameJam. We managed to make two playable games in 48 hours, and had a blast doing so. You can download and read more about the games on the link below. That’s it for this update, so check back later for more exctiting news! Last night we finally got SpinSling through to production on the Google Play Store. That’s pretty awesome, right? If you happen to live in Norway, Australia or New Zealand, feel free to download and try our first game, we’re really excited about it and we’d love for people to try it and give us their feedback! Introducing: Oculus Rift support for SpinSling! 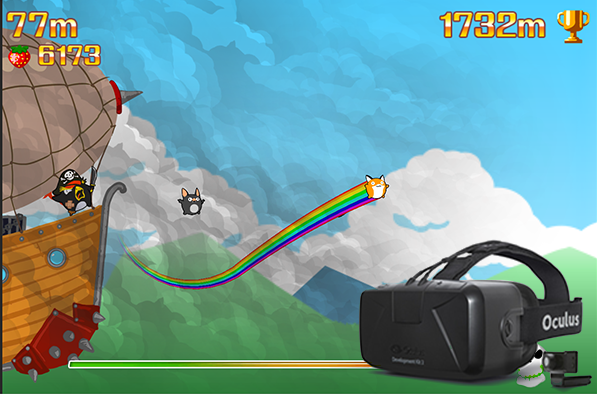 Retrogene is happy to announce that we’ll be bringing virtual reality to our high speed, critter-spinning endless runner. Our team had no doubt that SpinSling and VR was a match made in heaven. It’s a fast, thrilling experience that you just can’t get anywhere else, and that is why we want to make it. There has been a few challenges adapting the original gameplay to VR, so we added a new game mode: First person. SpinSling is a game that revolves around spinning around in a revolving motion. One of the challenges we face as designers are to ensure that the game remains fun throughout all of our modes, and currently, motion sickness has been a problem for a few of our testers. To make sure that everyone can take share in the fun that VR brings, we’ve designed a device to negate any problem with motion sickness that might occur. The device will mimic the motion of the game, so that your mind, and yourself, can truly believe you’re in this world. Don’t forget to bring your mobile device inside the SpinSling VR experience enhancing device. Every Sunday the Retrogene devs (that’s us) meet up to talk about our projects. It’s a valuable time where everyone can catch up on what has happened, something which is appreciated greatly since we all have part-time jobs as previously mentioned. Sundays become our time to check our to-do-list and figure out what is missing from our game and it’s good to see that stuff is coming together! 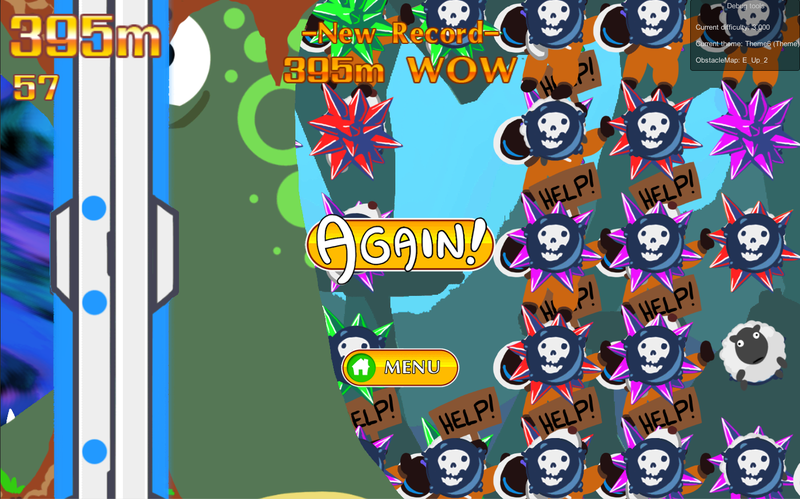 One of the newest additions to our game is the pirate ship. He has sort of just been standing around for a while, but now he’s covered in an ominous cloud and chases you, gradually increasing his speed as you spinsling your way through the many worlds. 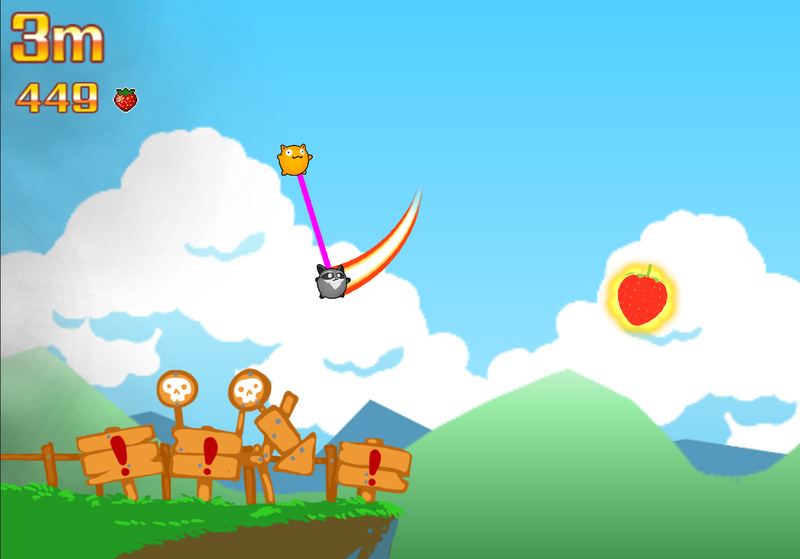 Also present is that pink line (which will not be pink by the time the game is done of course). That’s been added to make the connection between the two characters stronger. There has been some confusion through playtesting where people don’t understand that you are in fact playing as two characters and not just one. Another problem we encountered was that our testers were struck with confusion the first few times they died by going under the screen. The signs we put up will hopefully inform the players of this before that happens. Good question my good sir/lady/[insert preferred title]. While we do have the option of letting players choose their characters now, there’s still the case of making the customization and unlocking of content work. We do want people to have the option of sharing their records to different social networks as well, so we’ll need to put that in there too. Mostly, I guess, the things that are missing is related to customization and interface. The game works, which is fantastic, although the occasional… hiccup, can still happen.